The Yale Law School is hosting the combined Robert L. Bernstein International Human Rights Fellowship Symposium and Arthur Liman Public Interest Colloquium titled “Detention on a Global Scale: Punishment and Beyond” on April 9-10, 2015. To complement this event there is currently on display at the law library a sampling of treatises that assess how the prevalent use of detention as a means of punishment, crime prevention, or administrative expediency in the context of border security against irregular immigration and counterterrorism have pushed the boundaries of democratic governance. 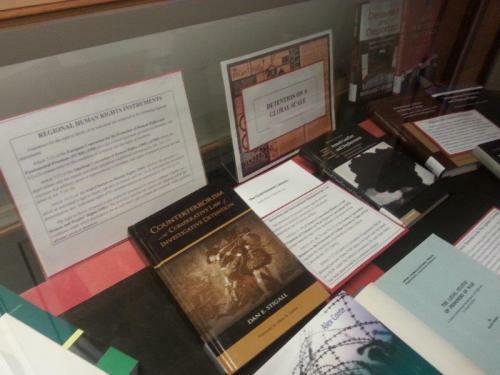 The selection of works from our expansive Foreign and International Law Collection features the theme of detention on a global scale and aims to illuminate the intersection of international human rights law, humanitarian law, and refugee law as well as criminal justice. · The liberty of non-citizens : indefinite detention in Commonwealth countries / Rayner Thwaites. · The EU, migration and the politics of administrative detention / edited by Michela Ceccorulli and Nicola Labanca. Suppressed terror : history and perception of Soviet special camps in Germany / Bettina Greiner. · Inside immigration detention / Mary Bosworth. · Prisoners of war – Legal status, laws, etc.